The first primordial stars began as tiny seeds that grew rapidly into stars one hundred times the mass of our own Sun. 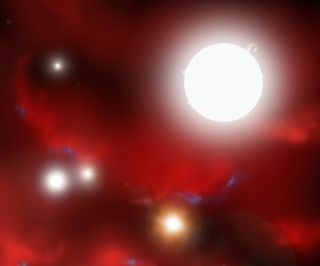 Seen here in this artist impression, swirling clouds of hydrogen and helium gasses are illuminated by the first starlight to shine in the Universe. About 13.7 billion years ago, the BigBang is thought to have created our universe. For about 1.5 billion years,the universe went through a cosmic dark age, until finally the first stars and galaxieswere born. Many details of how those stars were born are not known, butthe new experiment helps fill in some gaps. "The first starformation is a really fascinating intersection between chemistry andcosmology," said researcher Daniel Savin of Columbia University in NewYork, during a Wednesday press conference. "What it's telling us is thatin order to understand the very beginnings of star formation, we need to reallyunderstand fundamental chemistry." The earlyuniverse was made mostly of hydrogen, with some helium and trace amounts ofother elements. This matter clumped together under its own gravitational pullto form clouds. Within these clouds, scientists think hydrogen atoms (whichcontain one proton and one electron) bonded with negatively charged hydrogenions (one proton and two electrons) to form molecular hydrogen, consisting oftwo hydrogen atoms chemically bonded. This chemical reaction served to cool andcondense the clouds until they were dense enough to ignite nuclear fusion, theprocess that powers stars. Theorists had predicted this chemical reaction, but hadtrouble calculating just how it would happen and how quickly. The researchers, led by Columbia astrophysicist HolgerKreckel, succeeded in recreating the reaction in the lab. The scientistscreated a beam of hydrogen atoms and a beam of hydrogen ions and merged themtogether to create hydrogen molecules. They were able to precisely tune thevelocities of the beams to calculate how changing their collision energy wouldaffect how quickly the reaction took place. Finally, the researchers compared their findings totheoretical predictions to constrain estimates of how massive thefirst stars likely were. "We can say with a much higher degree of confidencewhether a primordial cloud will actually form a star," Savin said. The team reported their findings in the July 2 issue of thejournal Science. Was the Big Bang Really an Explosion?